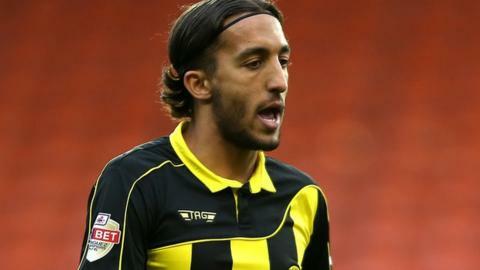 Burton Albion hung on to beat a Peterborough United side that played with 10 men for more than half an hour. Abdenasser El Khayati latched on to a neat Stuart Beavon cut-back to fire the hosts ahead before the break. Beavon pounced to make it 2-0 after Ben Alnwick spilled a Mark Duffy shot, before Gabriel Zakuani was sent-off for a challenge on Timmy Thiele. Marcus Maddison pulled one back from 30 yards while Jermaine Anderson had an injury-time equaliser ruled out. "It was rubbish. The second half was even worse. We scored two good goals but I was not happy with how we played, was not happy with the performance, was not happy with the dynamics of the team. "We became sloppy. We became not Burton Albion. We didn't play the game out as we can. We didn't look (like) a team and that's not what we are about. "I'm happy with the points, don't get me wrong, but the result should have been so, so, so much better." Match ends, Burton Albion 2, Peterborough United 1. Second Half ends, Burton Albion 2, Peterborough United 1. Attempt missed. Jermaine Anderson (Peterborough United) right footed shot from outside the box is close, but misses to the left. Shaun Brisley (Peterborough United) wins a free kick in the attacking half. Corner, Peterborough United. Conceded by Tom Naylor. Attempt missed. Jermaine Anderson (Peterborough United) right footed shot from the centre of the box is close, but misses to the left. Aurélien Joachim (Burton Albion) wins a free kick in the defensive half. Substitution, Burton Albion. Lucas Akins replaces Abdenasser El Khayati. Jack Payne (Peterborough United) wins a free kick on the left wing. Attempt missed. Tom Naylor (Burton Albion) right footed shot from outside the box misses to the right. Corner, Burton Albion. Conceded by Shaun Brisley. Corner, Peterborough United. Conceded by Aurélien Joachim. Foul by Alex Davey (Peterborough United). Attempt missed. Abdenasser El Khayati (Burton Albion) left footed shot from the centre of the box is close, but misses to the left. Corner, Peterborough United. Conceded by Shane Cansdell-Sherriff. Substitution, Peterborough United. Shaun Brisley replaces Tobi Adebayo-Rowling. Attempt missed. Matthew Palmer (Burton Albion) right footed shot from outside the box is just a bit too high. Goal! Burton Albion 2, Peterborough United 1. Marcus Maddison (Peterborough United) left footed shot from outside the box to the top right corner. Attempt saved. Jon Taylor (Peterborough United) right footed shot from outside the box is saved in the centre of the goal. Attempt missed. Matthew Palmer (Burton Albion) right footed shot from the left side of the six yard box is close, but misses to the left. Substitution, Peterborough United. Conor Washington replaces Michael Bostwick. Substitution, Peterborough United. Jon Taylor replaces Harry Anderson. Substitution, Burton Albion. Matthew Palmer replaces Stuart Beavon. Gabriel Zakuani (Peterborough United) is shown the red card. Timmy Thiele (Burton Albion) wins a free kick on the left wing. Goal! Burton Albion 2, Peterborough United 0. Stuart Beavon (Burton Albion) right footed shot from very close range to the bottom right corner. Attempt saved. Souleymane Coulibaly (Peterborough United) right footed shot from a difficult angle on the left is saved in the bottom left corner.